Panda-Cow was watching as I walked by on the track from Roystone Grange. What was she thinking? It's almost impossible to read a cow's mind. All I know is that they watch me whenever I enter their territory. Perhaps, like Islamic State terrorists, they are silently planning to take over the planet. Before I could hike up to the top of Minninglow Hill, I had to traverse a wide cow field. The varied herd was under the command of a stocky white bull with muscles like Arnold Schwarzenegger in his prime. When he saw me he bellowed a resounding war cry, He was a four-legged Terminator. Most of his herd proceeded to the adjoining pasture but several stragglers remained in the field I needed to cross, including a few of this year's calves. There was an edginess about this herd and Arnie continued to bellow as if to say, "Get your lazy asses down here!" Warily, I made my way across the field, keeping as far away from the calves as I could. A big grey beast bolted down from the ridge and I had to yell a couple of "Yee-ha's", waving my hands to divert her as the ground trembled. After all, t's not a good idea to be trampled by a 1500 pound animal. Yesterday felt like the very last day of summer. Without a jacket but with my camera on my shoulder, I set off walking in warm September sunshine. I was on my way to Minninglow. It is a special hill in Derbyshire limestone country, commanding far-reaching views over the surrounding countryside. However, that is not why it is special. On top of the hill there is much evidence of ancient burial practices dating back seven or eight thousand years to the Neolithic period. Bronze Age activity is also evident. Archaeologists tell us that Minninglow is the location of the largest Bronze Age chambered burial mound in Derbyshire. Frustratingly, the burial mounds on the hill were probably first raided by Roman soldiers in the second century AD. Later, amateur Victorian investigators may have taken away yet more valuable artefacts. In this sense Minninglow is rather like one of Egypt's pyramids - pillaged before the more respectful modern age came along. You might be wondering about the name - Minninglow. It's an odd name isn't it? In Derbyshire the place name ending "low" always refers to a hill and usually one that has seen burial activity. "ing" usually indicates a settlement in Anglo Saxon terminology. Consequently it is likely that we should be thinking about someone called Minn who commanded a small community on the slopes of this sacred hill. Alone on Minninglow for a few minutes, I rested on the stones, sensing the presence of men and women who had been there thousands of years before. They came to bury the dead and to observe the stars above. With all that we know, we are no better and no wiser than they were. All of my pictures show Minninglow. Yesterday, a human interest news story was kicking around the airwaves in Britain. Essentially, a couple of interested "experts" were saying that tackling should be banned when boys or girls are playing rugby at school. Indeed, tackling during school rugby matches or practice sessions can certainly result in injury. Every year a handful of schoolchildren incur serious injuries whilst playing rugby - injuries that might even put them in hospital or worse still, in wheelchairs. I guess I was just plain lucky. I played rugby regularly between the ages of eleven and eighteen and never suffered a single injury worth mentioning in all that time. I loved rugby - the exercise, the camaraderie, the strategy and the weekly battle to beat the opposition. In my humble opinion, if you took tackling out of rugby it wouldn't be rugby - it would be something else. 1) All staircases to be made from foam rubber so that if people fall, the possibility of injury will be massively reduced. Where feasible, a pit filled with foam rubber blocks should be placed at the bottom of every staircase. 2) The eating of fish should be banned as fish contains small bones that may cause choking and possibly death. 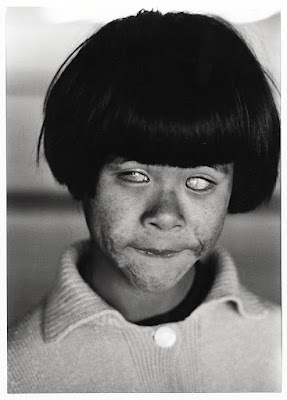 In my experience even filleted fish can contain stray bones so filleted fish ought to be included in the ban. 3) Dog ownership should no longer be allowed as every year thousands of people are admitted to hospitals following dog attacks. There isn't a year that passes by without a few people being killed by dogs. This has to stop. To fill the void dog owners can have cats or hamsters instead. 4) In winter when it's icy outside, it should be illegal for senior citizens to step outside their front doors. 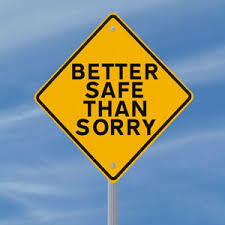 They must stay safe inside because icy pavements (not sidewalks) cause so many injuries and broken bones each winter. Statistics show that old people are significantly more vulnerable than younger folk. 5) On our nation's roads a speed limit of 15mph should be instituted right across the country - on urban, suburban and rural roads as well as motorways. This will almost eliminate road traffic accidents and thereby pave the way for an astonishing fall in the number of road deaths we see each year. Have you got any other safety proposals you would like to bring to the table? Last Thursday afternoon and Friday morning I was banned from our kitchen. Lady Pudding and The Beloved Daughter were busy making cakes. They had three to make - a chocolate one, a carrot cake and a lemon cake. Ultimately, the plan was that the completed cakes would be stacked on top of each other to form a wedding cake. 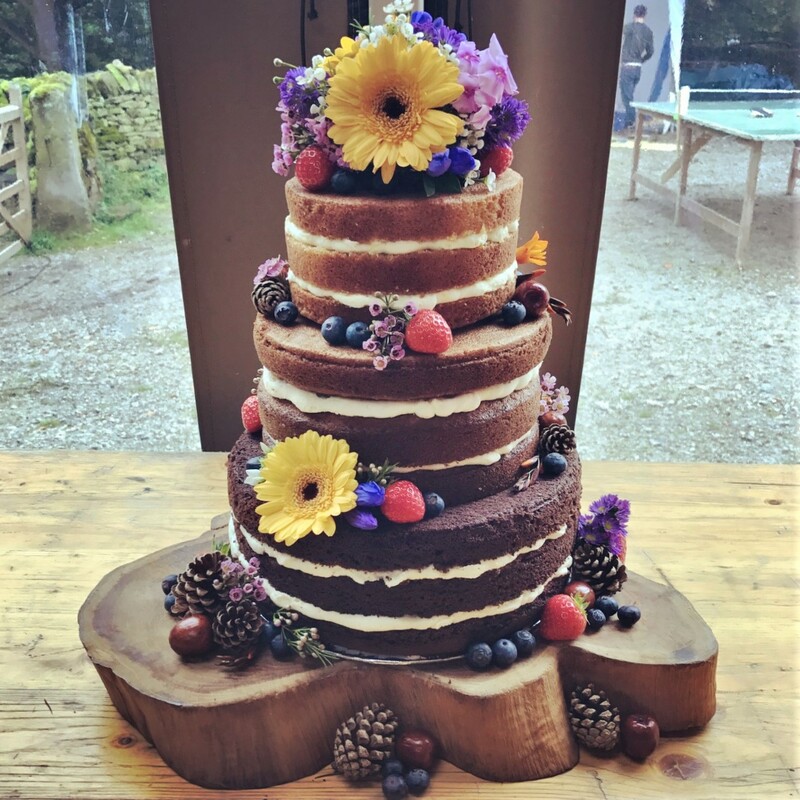 Apparently, these days, couples can eschew the traditional iced wedding cake with its rich fruitcake interior and opt instead for something more "natural" - in other words a "naked cake". Because of the fresh nature of a naked cake, it needs to produced very close to the wedding day. The wedding in prospect was held in Edale, west of Sheffield on Saturday. The bride who was embarking on the marital voyage was Ella - one of Frances's best friends. Like many bright young English "professionals" from the north, Ella and her bridegroom now live down in London. However, they wanted a rustic, countrified wedding in the shelter of the beautiful Edale valley surrounded by friends and family. I drove the cake makers over there on Friday afternoon, taking care to drive slowly round every corner we encountered. The three parts of the composite cake were in the boot of the car and we didn't want centrifugal forces to slide them around. And hurrah! We got the cake to Edale successfully. Last week The Yorkshire Pudding Wrap went viral. Essentially it's a medium sized flattened Yorkshire pudding filled with roast meat, some vegetables and thick gravy. The pudding is then wrapped - rather like a burrito. No knife or fork required - you just bite into the thing. 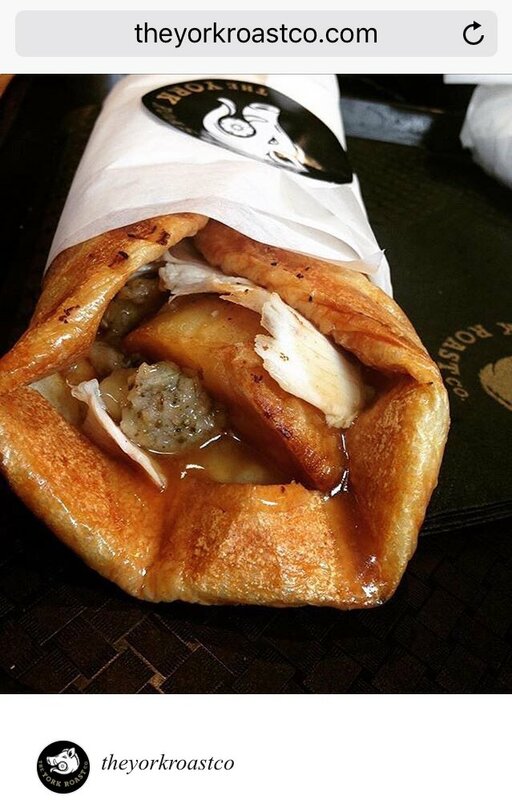 Customers have been queuing up to get their paws on Yorkshire Pudding Wraps at the various York Roast Co outlets across the country. Below a blonde food journalist from London has her manicured fingers wrapped around one of the said items, preparing to plunge it between her pink lips. She will not be disappointed. 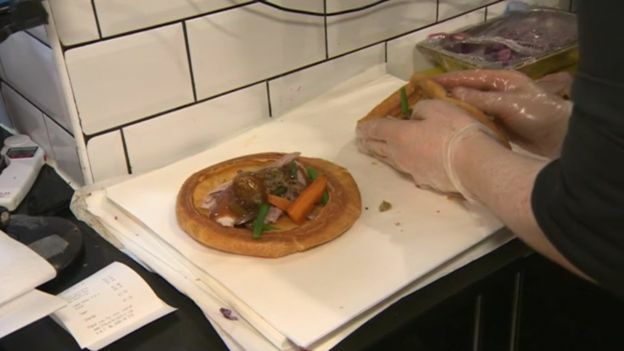 And below these words, Yorkshire Pudding Wraps are being prepared for hungry customers who are banging their fists on the counter while chanting, "We Want Yorkshire Pudding!" Her's a snip from the menu of York Roast Co. If the popularity of these wraps increases further, it is perfectly possible that I will be asked to appear in TV commercials endorsing Yorkshire Pudding Wraps. The end slogan will be "It's a Wrap!" - delivered in the manner of a famous film director - perhaps someone like Alfred Hitchcock who was, I understand, often mistaken for a giant Yorkshire pudding. One Christmastime, during my university days, I secured a job as a temporary night watchman. It was at a caravan (American: trailer) factory on Swinemoor Lane in Beverley. The first night I turned up early for my shift so that Bob, the head security man, could show me the ropes. I entered the small reception building by the factory gates and was taken into the back room. "Don't be scared!" laughed Bob. "He'll not hurt you!" A massive hirsute Alsatian or German Shepherd was nuzzling my groin with his big snout. Bob said that his name was Shane, Every three hours through the night it would be my responsibility to lead Shane round the factory complex so that he could sniff out potential trouble such as intruders or electrical faults. After showing me the key box and providing emergency phone numbers, Bob walked me round the factory where thirty odd caravans were in different stages of construction - from skeletal chassis to upholstered palaces on wheels. I made myself a mug of tea and switched on the radio. Shane seemed to be eyeing me as if I was a massive juicy bone but Bob had promised that he would not hurt me. At about nine o'clock it was time to do our first tour of the factory. I picked up Shane's lead and he was up off his bed under the counter like lightning with his big pink tongue lolling and his tail wagging like a huge furry metronome. We circled the factory, checking doors and entered the administration building with its shiny boardroom. I even had a swivel on the chairman's leather seat. It was like a throne. Over the next four weeks I became very attached to Shane. He was always excited to see me. Between factory tours, I did university work, listened to the radio and drank tea. One bleak, wintry night someone pressed the buzzer on the locked side gate. Shane went wild, barking like The Hound of the Baskervilles. It was two night cops. They were after a rest and a chinwag in the warm reception building and perhaps a cup of tea too. Apparently, they had been expecting Steve, the regular nightwatchman to be on duty. I think Shane recognised them so he soon settled down. They never came back which was fine with me. Police officers always made me feel rather uncomfortable. Another night as we were walking round the factory perimeter, Shane growled and then barked. He pulled me to one of the rear doors. I unlocked it and let Shane inside. Thirty seconds later he returned with a workman's flat cap clamped in his jaws. What an amazing sense of smell he had! And one lazy Sunday afternoon as I was reading "As I Lay Dying" by William Faulkner, Shane's ears pricked up. He was up from his bed and barking like crazy. I led him to the perimeter fence and far away - perhaps half a mile - across the flat marshland that bordered the factory I could just make out two or three kids playing. That's what Shane had noticed. What amazing hearing he had! That month long temporary job was the best one I ever had. I was paid handsomely and most of the time I was sitting in a warm room, reading or studying, drinking tea and listening to the radio with my new best friend - Shane. So you see that in spite of my antipathy towards dogs, I have known that special wordless bond that dog owners often feel. Above - it's the new South Korean President Moon Jae-in with his rescue dog - a four year old cross-breed called Tori. The President has another older dog called Maru and a stray cat he adopted called Jing-jing. The image suggests that Koreans really do love dogs... and not just on their plates. In recent years there has been a marked decline in the consumption of dog flesh in South Korea. At the same time there has been a corresponding growth in the ownership of pet dogs and a shift in attitudes towards dogs. President Moon Jae-in has been happy to promote a more westernised relationship with dogs even though it was always the case that thousands of Korean families had pet dogs in their homes. To the majority of Muslims the very idea of eating pork is horrendous. To millions of Hindus the thought of eating beef is outrageous. According to legend, the French eat snails and frogs' legs all the time. One's meat preferences are frequently linked with one's particular cultural heritage. British people are generally averse to eating horse but viande-de-cheval is widely available in French supermarkets along with animal brains, eyes, lungs, hooves and trotters. The British have forgotten the potential culinary joys of such products and even turn their noses up at liver and kidneys these days. Here in the blogosphere there are many dog lovers. People often blog about walking their dogs, taking them to the vet's or even sleeping with them. However, dog ownership has never appealed to me. My family didn't have dogs when I was a child and frankly I don't see the point of them unless they are being used to round up sheep, guard property or sniff out drugs. You have to walk dogs, clean up their faeces and feed them. It's not for me and another thing - dogs smell. Dog owners may become accustomed to dog odours but those of us who live in dog-free homes can usually detect the sickly aroma of dog when we enter a dog owner's home. The level of smelliness will depend on the size and number of dogs in the home, diet, gender, the age and breed of the dog and how often the dog is shampooed. No wonder that my father-in-law - who was a Lincolnshire farmer - kept his two working dogs in a kennel or locked up in the barn. He loved those animals but never wanted them in the house. I realise that in expressing my latent aversion to dogs I risk being pilloried by dog owners everywhere. They are a fearsome lot and what is more some of them snarl and bite. I'm talking about the owners, not the dogs! Last week the odious Boris Johnson, who has a rapacious desire to become Britain's next prime minister, was accused of back seat driving. He was, commentators said, attempting to call the shots on our nation's journey out of the European Union. Later, his noble leader, the current prime minister - Theresa May - protested that on the journey to Brexit she would be driving from the front. There would be no back seat driving on the road to Brexit. Brexit lies between the shire villages of Narnia and Neverland. In the centre of Brexit, upon the village green, there is a maypole bedecked with blue, red and white ribbons. It's just across from "The Farage Arms" from which communal singing emerges on weekend evenings - for example "We'll Meet Again", "Down at The Old Bull and Bush", "Jerusalem" and "Yesterday" by The Beatles. In the quaint village shop, run by jolly Mrs Goggins, village children can buy traditional confectionery. They come running in after school, with their rosy cheeks and knee socks, slapping their sixpences and shillings on the counter before running out with liquorice, sherbet dips and gobstoppers. Most of the houses in Brexit are thatched with hollyhocks and old-fashioned roses growing in cottage gardens. The palatial Elizabethan manor house on the edge of the village is occupied by tousle-haired Squire Johnson and his progeny. He often screeches up to the shop in his muddy Land Rover to buy "The Daily Telegraph" and twenty Woodbines, heartily greeting fellow villagers who he privately refers to as his "serfs".or "loyal subjects". In Brexit, people go to the village church every Sunday - St Theresa's with its ancient Norman tower. There is still a youth club and a village hall. The annual Brexit Flower Show is always well-attended and most years The David Cameron Memorial Trophy for the biggest vegetable is won by either Farmer Gove or Mr Fox. Their beaming smiles are as legendary as their bitter rivalry and their giant courgettes. All is sweet in Brexit. It's a place which seems to have been by-passed by the troubles of the world. Gentlemen still doff their caps and ladies curtsy. Children skip or play marbles in the playground. The village is twinned with Braunau am Inn in Austria and has featured in several TV period dramas including "Vanity Fair". Yes. Somewhere over the rainbow, the living is good in Brexit. We'll get there one day. Yes I want you to know today, that we, as a people, will get to the Promised Land. Yesterday I went to The Lakeside shopping centre at Doncaster, I bought some new shoes and a pair of trousers. I had no luck with regard to new underpants and a new belt. That was rather frustrating. For me shopping for clothing has always been a painful chore. I hope the trousers fit me as I couldn't be bothered to try them on. To be honest, I am the opposite of a fashionista. Feeling hungry, I parked up at McDonald's and ordered a quarterpounder "meal" with a latte. It was so warm in the sunshine that I sat outside to consume this "meal" and it really felt like a summer's day. Earlier I had driven to the shopping outlet via back roads that avoided the motorways. I went to Maltby then north to Braithwell and on to Old Edlington. This is a small settlement I had never visited before. I got out of the car to have a look at the village's cute twelfth century church - St Peter's. Sadly, it was locked up and clearly it was no longer a functioning church. The windows were boarded up . Apparently and tragically it suffered some vandalism in the past. I would have loved to get inside that church to see the Norman stone carvings within, However, it was only when I got home and Googled the church that I discovered where I might have borrowed a key from. It was too late. I wore the new shoes to walk up to "The Hammer and Pincers" for the Tuesday quiz and I am happy to report that Mike, Mick and I achieved the top score. It helped that we knew that Florida is bordered by Georgia and Alabama and it also helped that we knew that the comic actress Rebel Wilson has recently won a landmark defamation case in Australia. To tell you the truth, Mike pinched that answer from a quiz sheet abandoned by a couple who had to leave early. The building to the right is an old dovecote. Between St Edmund's Head and Hunstanton town in the county of Norfolk, there's a very interesting cliff. It is striped and it runs for almost half a mile. You might say that it is a natural monument to the geological epoch known as the Cretaceous Period. This was a time when dinosaurs were alive and the planet was generally much warmer. It lasted for seventy nine million years between the Jurassic and Paleogene periods. Of course it occurred many millions of years before the first apes appeared. I am sure you will agree that seventy nine million years is a very long time. During those 79,000 millennia an enormous amount of plant and marine animal debris sank to the bottom of countless inland lakes and seashores gradually forming layers that were compressed and ultimately petrified. It is those layers that we see in the striped cliff at Hunstanton. The bottom brown layer was of course laid down first. 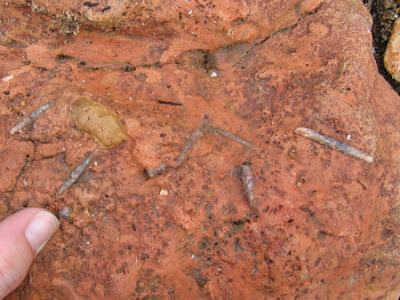 It is made up of carstone and contains very few animal fossils. The next layer is the Hunstanton Red Rock layer. It is actually chalk but was coloured red by iron pigmentation. The thicker white layer above is also chalk and part of the Ferriby Formation. This was laid down towards the end of the Cretaceous Period. Should we head back to the car park? Did we even have time? It was being blown quite rapidly in our direction. There were no trees. No beach huts. Nowhere to hide. We pressed on towards Heacham. And then the lashing rain struck - ice cold upon our faces. All we could do was crouch by some thorny bushes up on the dune path. And as I sheltered there, what did my beloved wife do? She got out her smartphone and laughing like one of those witches in the opening scene of "Macbeth" she snapped me. 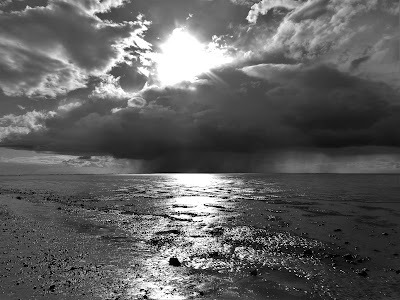 Fortunately, the rain didn't last very long and we continued our beachside walk with my ugly mug still trapped in the gubbins of her phone. We were sitting in Fisher's fish and chip restaurant in Hunstanton when Shirley believed she'd spotted a familiar face. When this woman got up to leave I saw her approaching our table and blurted out, "Excuse me. Are you Cheryl?" It was indeed Mrs Berry who had been the headteacher at my son's secondary school throughout his time there. She departed from that school round about 2001, just before our daughter went up there. Now Mrs Berry was an unusual headteacher in that she was universally admired and respected by pupils, parents and staff alike. I remember an interview with her in the Sheffield "Star". She said that she liked to be outside her office during the school day, meeting children, talking to staff, visiting lessons. She also taught one class Mathematics every school year. Any office work she needed to do would happen when the school day had ended. I know for a fact that this wasn't an idle boast, designed to impress because in the early nineties I had occasion to go up to that school every Monday evening and I would always see Mrs Berry beavering away in her office until perhaps eight thirty or nine o'clock. You should understand that this was a school with a pupil population of around 1800. Being the leader of that school was like being the leader of a significant business venture. Every day brought new problems to solve, new demands on Mrs Berry's time. But she remained cheerful and approachable, refusing to surround herself with mystique or bloated self-importance like many other heads of secondary schools. Now here's the thing. On Wednesday night she asked what our son's name was and we told her. She said that of course she remembered him but she didn't add any follow on information to confirm that knowledge. Afterwards, I thought - how could she remember him? He was an ordinary boy who attended school every day and was never bothersome. During Mrs Berry's ten years at the school she would have been in charge of over 4500 students and hundreds of members of staff. How could she possibly remember our Ian? As you may recall, I was an English teacher myself and every year I taught around two hundred pupils in different classes. I saw these children for four hours a week and yet if I met one of those children's parents today it is highly unlikely that I would remember ever teaching their now grown up child. It left me wondering if Mrs Berry always claims to remember former pupils that she chatted to in the school's corridors or engaged with ever so briefly in classrooms. Perhaps she realises it's what parents want to hear - remembrance. "Yes - I remember your little darling" and not "No - 4500 pupils passed through the school in my time. How could I possibly remember your child?" However, I should remind myself that Cheryl was and is a remarkable human being. After leaving the local secondary school she went on to do a variety other demanding jobs and even received an M.B.E. for her services to education and young people. Maybe she did remember. We are home now after three lovely days in Norfolk. The weather was kind to us and we saw many marvellous things. Even though I have been an atheist since childhood, I am always drawn to churches. England has a wealth of ancient churches and each one is different from the next. Their architecture and internal fittings speak eloquently of the past - of craftsmanship, of community, of spiritual aspiration, of wealth and poverty and of the passing of time. During our days in Norfolk and south Lincolnshire we entered twelve churches and I snapped lots of ecclesiastical pictures. It was nice to find that ten of the twelve churches were open to inquisitive visitors. When I find a country church open, I usually write something like this in the visitors' book - "Thank you for leaving your wonderful church unlocked for passing visitors to enjoy". It is important to write in visitors' books as they provide visitor data for charitable bodies that help to fund the maintenance of our old churches. Nowadays, the number of British people who claim they have "no religion" is greater than the number of people who say they are believers. Church attendance is so low in some villages that many parish churches are now redundant. Their maintenance is an enormous challenge. Personally, I would rather see billions of pounds spent on saving our beautiful churches than on nuclear armaments that will never be used. It was once the expectation that everybody in every rural community would attend church on a Sunday. Failure to attend church would not only ignite much tutting and shaking of heads, it could also jeopardise one's livelihood. Our churches were packed. Hymns were sung, prayers were recited and sermons were endured. 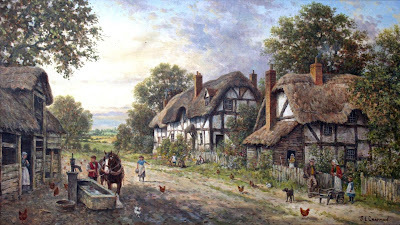 Vicars often lived in palatial homes with extensive gardens. The church was the very hub of every community. It dealt with birth, confirmation, marriage and death. It was the one place where a community came together. The church was far more influential in people's lives than secular politics. As someone who dwells inland, I certainly do like to be beside the seaside. How about you? We are in north west Norfolk now. We stopped off in Sleaford, Lincolnshire on the way over. In fact we were in Sleaford for three hours. It's a charming little town with a lovely old church, dedicated to St Denys. Apparently, he was the bishop of Paris in the third century. I could bore you silly with the knowledge about Sleaford I acquired yesterday afternoon. We visited an antiques shop, a little art gallery, The Navigation House Museum and several shops as well as enjoying a light lunch in The Marketplace Cafe. There was also a bizarre modern building called The National Centre for Craft and Design. We found it terribly disappointing. Where was the craft? Where was the design? The buttons in the lift were worn out and the young women at the desks in the two galleries were messing about with their smartphones to relieve their obvious boredom. It was a day of changing weather. Pouring rain turned to bright sunshine and back again as we drove across the flatlands of south Lincolnshire. You could see for miles. It must be easy to feel tiny if you live in such a landscape. We were on the A17, heading to King's Lynn. Soon we were at our rental apartment in the Norfolk village of Dersingham. It's in the west wing of a grand house owned by a local solicitor and his rather posh wife - Sheena. She advised us against dining in either of the village's pubs saying she hadn't been in them for over twenty years while implying they were for the undiscerning hoi polloi. However, we ignored her snobbish advice and enjoyed delightful evening meals in "The Coach and Horses" surrounded by other ordinary people. I should not be sitting on this sofa with this laptop. I should be upstairs having a shower and a shave and getting ready to travel to Dersingham in Norfolk.We are going there for a three day break and plan to visit Hunstanton and King's Lynn. We might also visit The Queen's country estate at Sandringham as it is within walking distance of Dersingham. However, I have never been overly keen on seeing the grand homes of the rich and privileged... Now, I need to get upstairs for that shower.